Florida is a big state filled with competitive small, medium, and enterprise level businesses that rely heavily on IT support to optimize workflow. 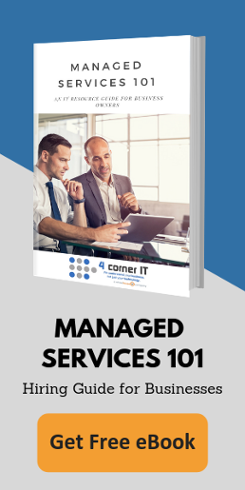 4 Corner IT offers that support and more, understanding your business and it’s technology – all while eliminating the need for an in-house IT department. We are a Managed Services Provider offering pro-active IT support services, including an array of Microsoft Office 365 services, specially designed for your Florida business. Aligning heavily with the cloud, we successfully serve industries ranging from legal firms to assisted living facilities to emergency air rescue. Our responsive IT support solutions eliminate the need for an in-house IT department and thereby expanding the reach of your company’s budget for more important pursuits. With the help of 4 Corner IT, IT support in Florida becomes simple. We provide our clients with personalized, quick assistance as well as in-depth repairs and troubleshooting services. Some common situations that have been managed by our team include resolving critical server downtime issues, repairing or salvaging data from malfunctioning hardware equipment, and helping employees utilize their company’s applications to the fullest. It is no accident that 4 Corner IT has become the strongest IT company in South Florida. We have made support easier and more accessible than ever before. With instant remote access both for your employees and our technicians, we can evaluate and troubleshoot problems from outside your office conserving time and energy for both parties. And with one reasonable flat rate, your company and employees get the IT security and technology awareness they need without having to hire internal IT management.